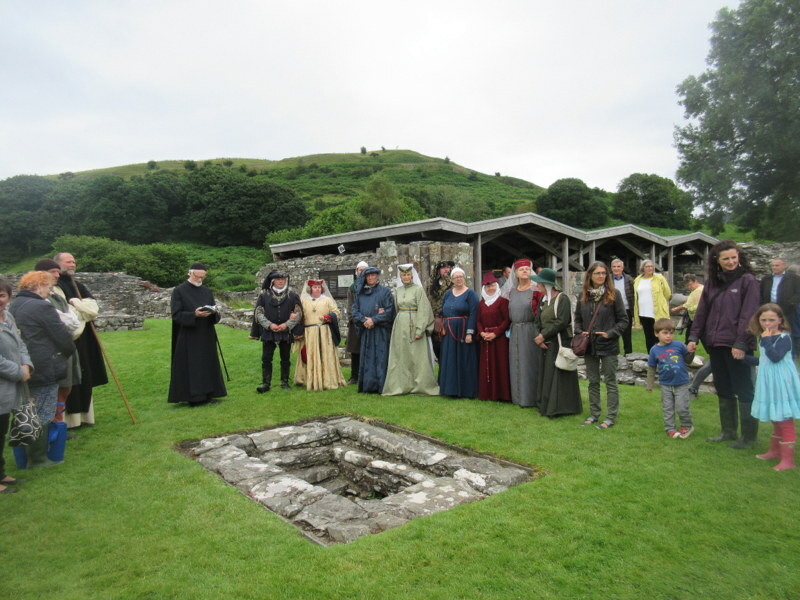 This year the Ceredigion Historical Society visited Llanrhystud, on that glorious Saturday when so many were indoors watching Megan and Harry’s nuptials or the FA Cup final. 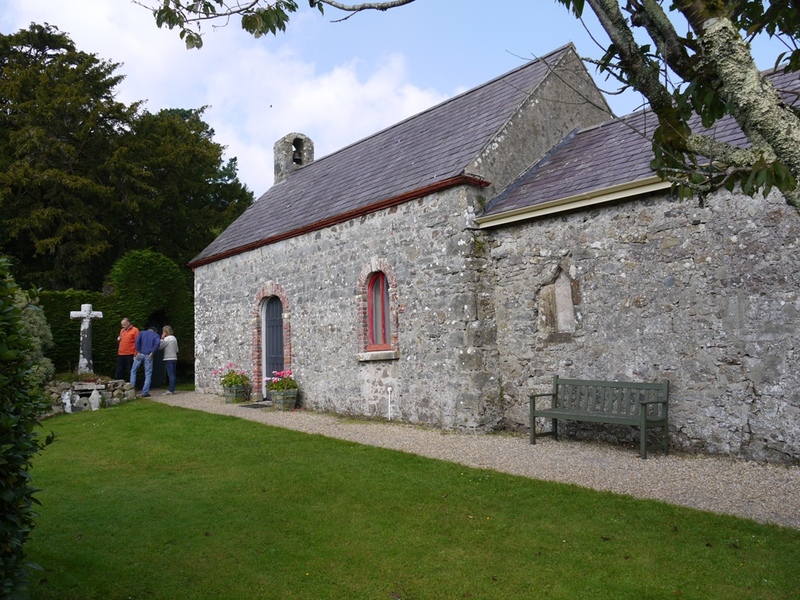 It is a quiet spot, in which the much-enlarged Victorian church sits immediately beside the Baptist chapel. We visited both. The former is an early work by church architect R.K. Penson and is notable for its stone spire. Spires are almost unknown in this county but where they do occur they are more usually built of timber and slate. 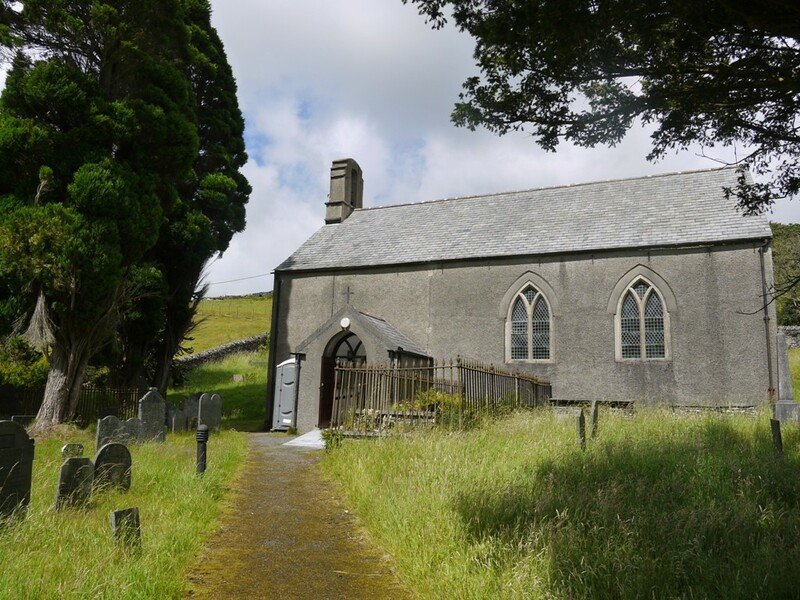 (There was formerly a tall narrow timber spire on Llandygwydd church, which warped so badly it was taken down in 1913 after just 56 years, the whole church being demolished in 2000). From my childhood I remember recognizing Chesterfield from the train by its warped and twisted spire, malformed as its timbers aged and shrank. 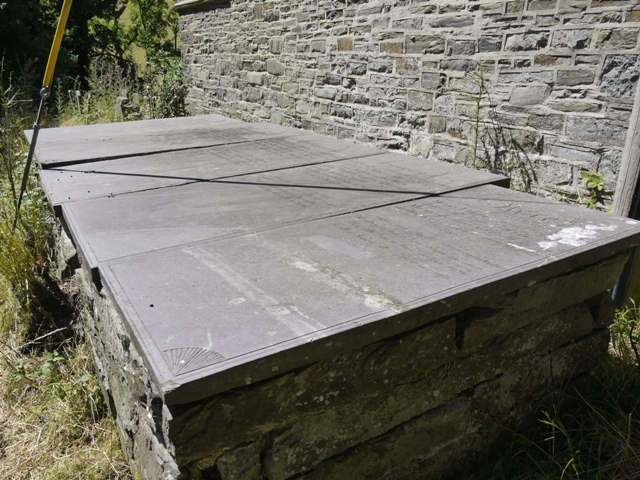 No chance of warping with Llanrhystud’s chunky construction. 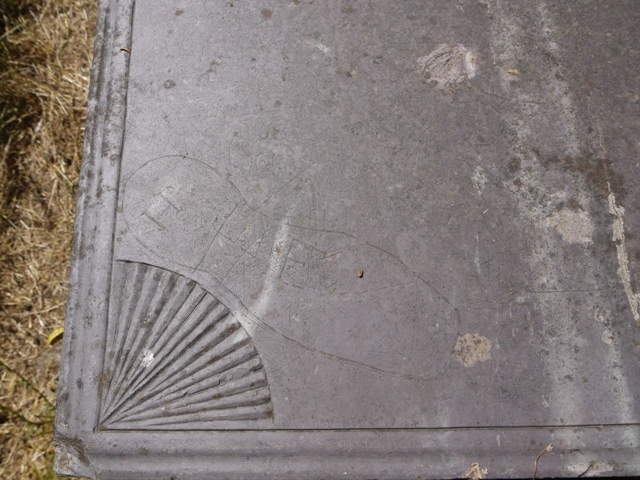 When the rebuild was completed in 1854 the old memorials were swept away. 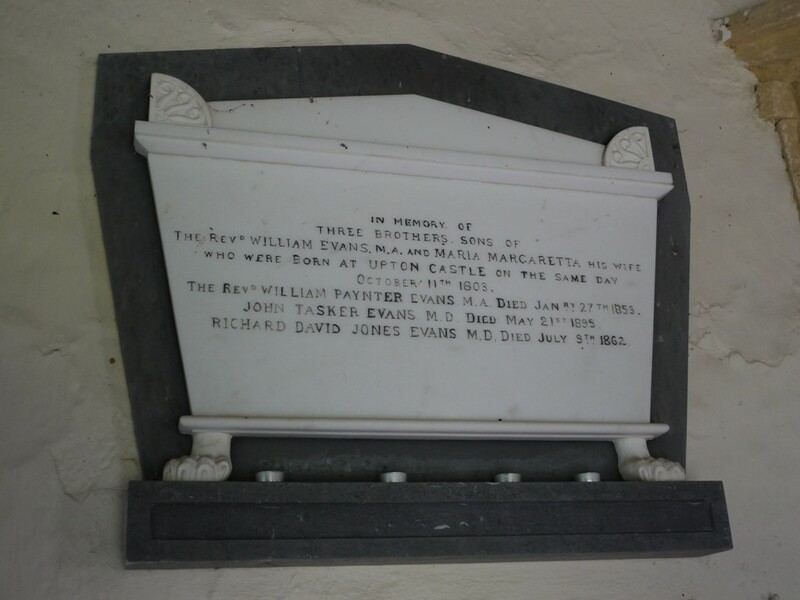 Most touching of the new ones is the fine white marble wall memorial to Mary Anne wife of John Hughes of Allt-lwyd and daughter of Alban TJ Gwynne of Monachty, who died in childbirth aged just 22 in 1833. Her child, a daughter lived only eight days beyond her, a reminder of the harsh obstetric hazards of the times. 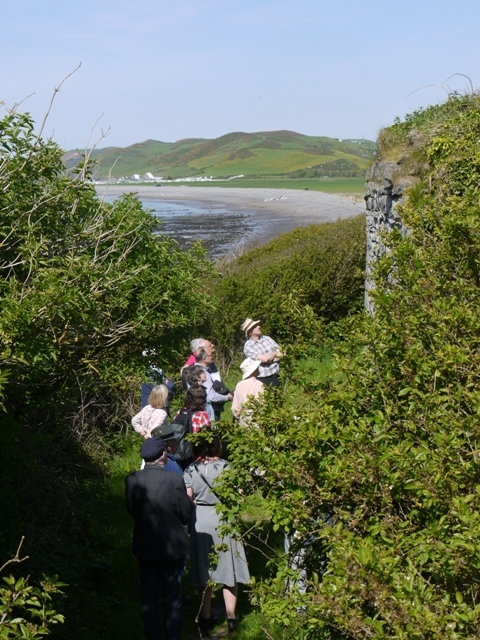 The group then set off down the coast to visit the lime kilns. It is hard to imagine the hive of industry at this spot 150 years ago. 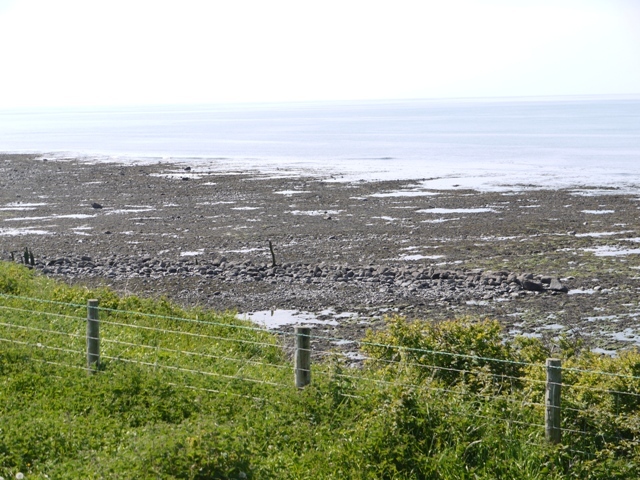 The beach at low tide shows the remnants of timber jetties, trackways and stone constructions where the boats came in to unload their cargoes of limestone and coal. 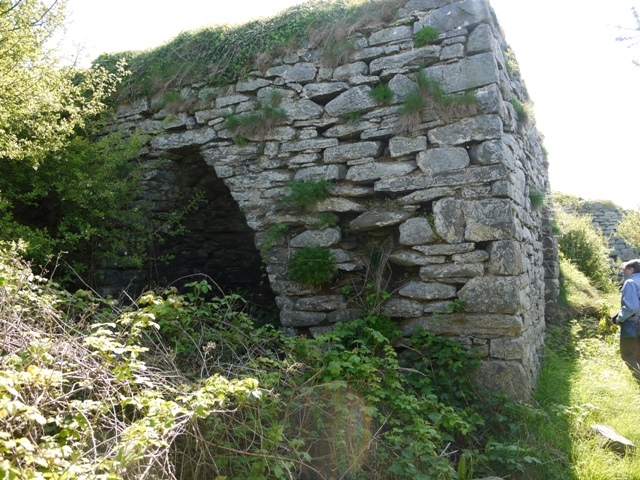 Four massive stone kilns stand just above the beach now largely hidden in a thicket of sloe and may. 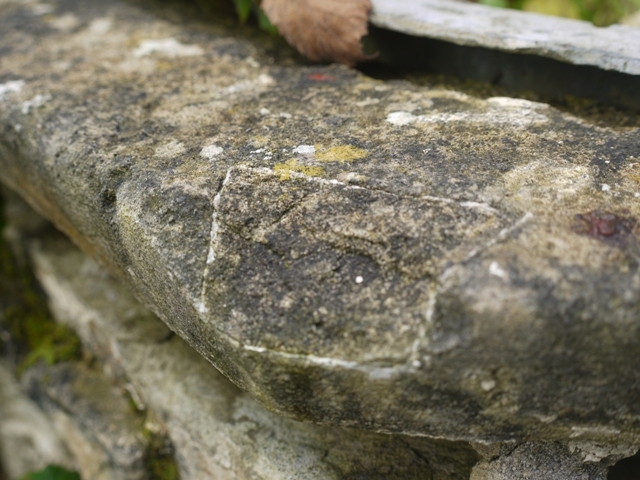 We learnt that the different limestones have different uses: that from the Pembrokeshire makes good agricultural lime, while that from the Glamorgan coast ( often specified by local architects as Aberthaw Lime) makes a strong cement. Most of the kilns have three corbelled apertures or draw holes, allowing the draught to be adjusted in the light of wind conditions. 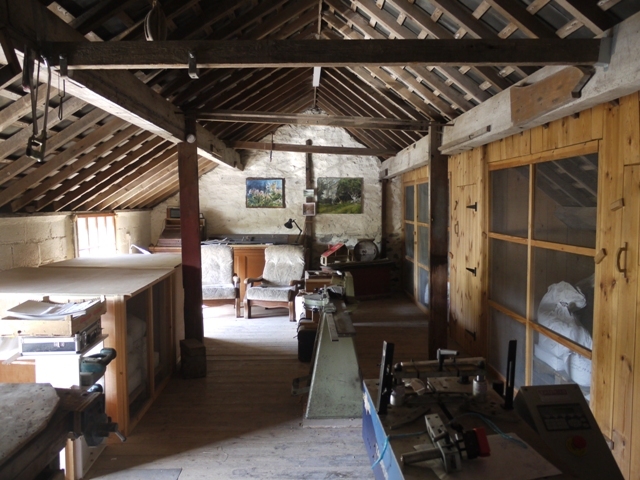 Our final visit was to Felin Ganol watermill not far from the ford across the Wyre. In the early 20th Century this was still a hive of industry, the waterpower driving millstones to grind locally-produced corn, and also generating electricity and driving carpenters’ machinery in the loft. 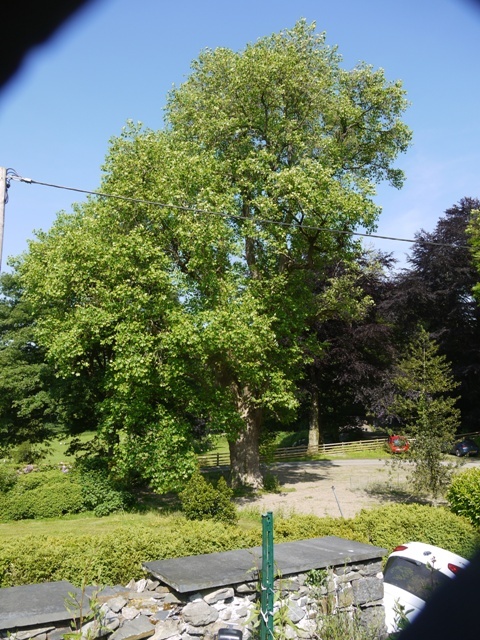 By the 1970s it was sold to new owners who preserved the historic interior and planted a fine Ginkgo in the formerly utilitarian back garden. It fell to enthusiasts Andrew and Anne Parry, who arrived 12 years ago to actually get it working once more. 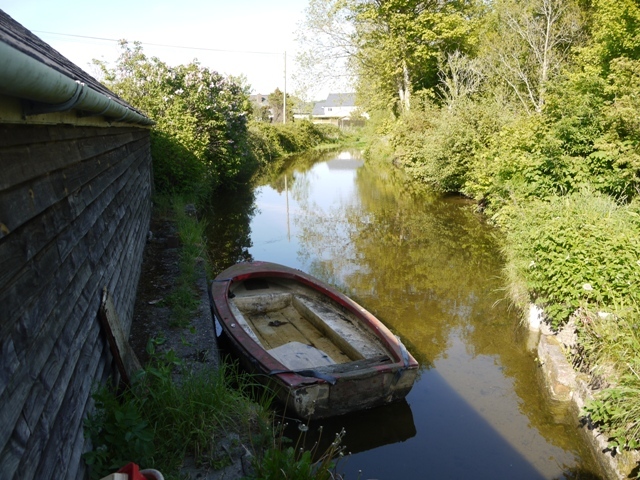 The restored leat now fills the millpond above the house, and at the tug of a lever we watched the wheel creak, grumble and slowly come to life. Then a gentle steady chugging sound fills the buildings as we watched the great cogged wheels transfer the energy to the two spindles which drive two pairs of millstones, and to the sieve which separates the grindings into white flour, semolina ( a coarser grind) and bran. 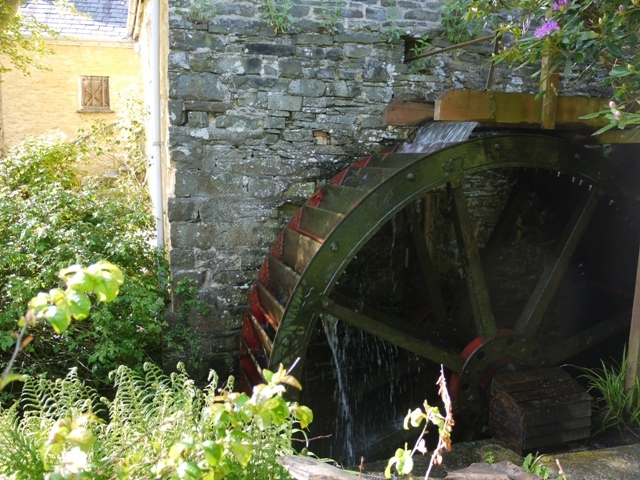 Felin Ganol, the waterwheel starts to turn. The products of milling have paid for the restoration, and Anne, whose background at IBERS explains her thorough knowledge of grain, has sourced heritage strains of wheat oats and rye varieties to mill. I came away with a kilo bag of semolina flour, a fine grain which feels like very soft sand between the fingers. At £2.50 its not cheap, but it brought a nutty flavour to my homemade quiche and made me realize how anodyne plain white steel-milled flour is as an ingredient. The concept of the Picturesque was to stir deep feelings in the visitor. His or her emotions should be stirred not only by the beautiful but by the sublime. A therapeutic shot of terror, engendered by a dizzy drop, a roaring cascade, or a dark rock-cut tunnel or cave were among the elements of a satisfactory Picturesque Landscape. Thomas Johnes of Hafod did his best to supply these scary elements, most notably with the precipitous narrow contoured path of the Gentleman’s walk to the south of the river, and the cascade cavern where the visitor passes, crouching, into almost total darkness in a rock tunnel before turning a slight corner and being confronted with a roaring waterfall blocking his path. Other elements were smooth, gentle and naturalistic. Such was the Alpine Meadow by the river side, and the careful gradients of the Lady’s Walk through the woods. 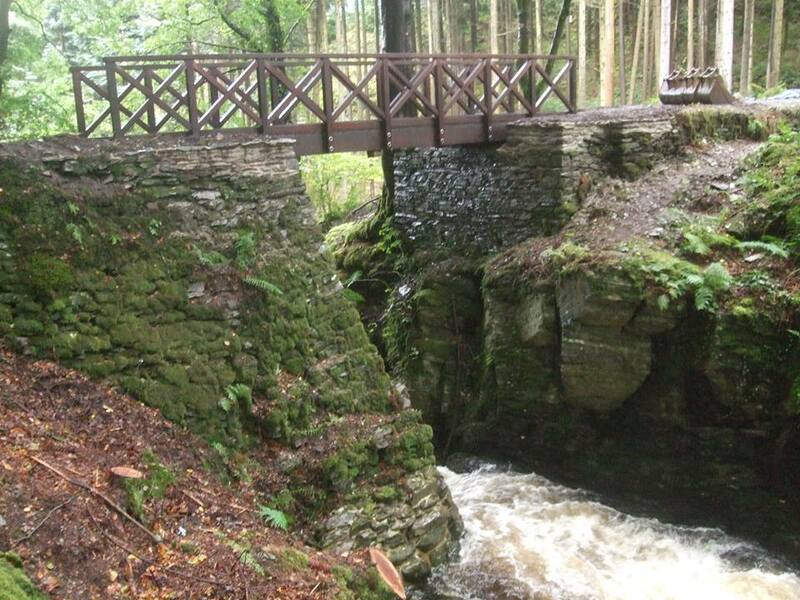 Equal smoothness of contour defines the old carriage drive which brought the visitor from London past Cwmystwyth and across a stone bridge over the Nant Peiran. We tend to forget that the early roadmaps, the Britannia and Ogilvy atlases (strip maps similar in concept to the bespoke navigation of a modern sat nav) provide annotated routes of which the very first in the collection takes the traveller from London to Aberystwyth, passing close by the Hafod estate. 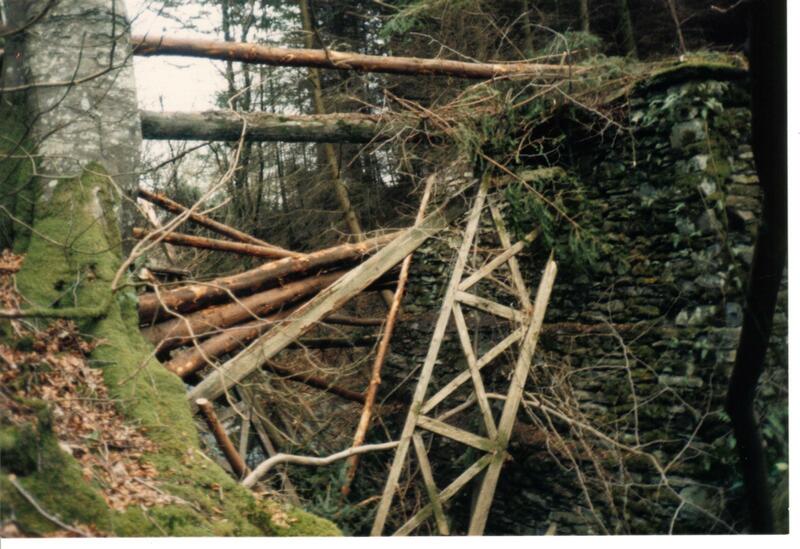 It is this old bridge, broken and impassible for many decades which is the latest object of careful re-instatement by The Hafod Trust. 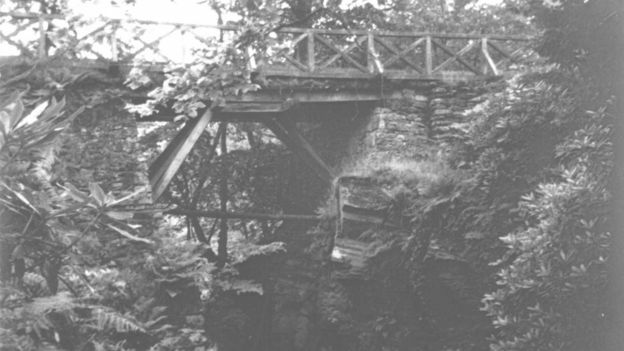 The wooden span was collapsed by the 1980s and as the stream tore away the fallen timbers there remained the tall abutments of the bridge, adjoined by two handsome beech trees framing an alarming chasm. Many a dog has hastened enthusiastically along the old carriage drive to pull up suddenly at the very edge. 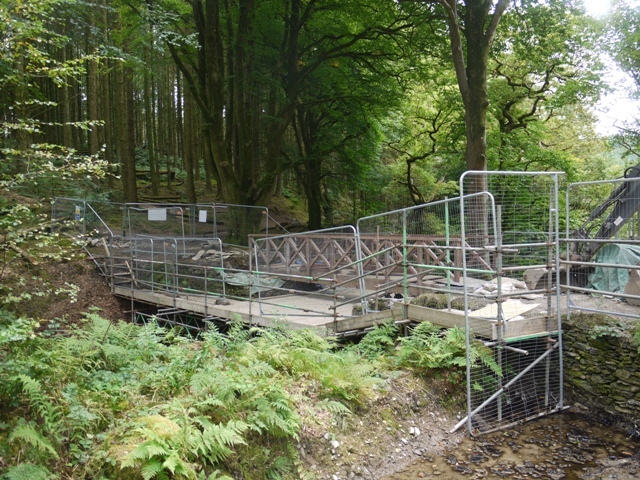 The new bridge span is of timber, echoing the 19th century remains, but much narrower, its purpose to provide access for walkers and for the more intrepid wheelchair user. 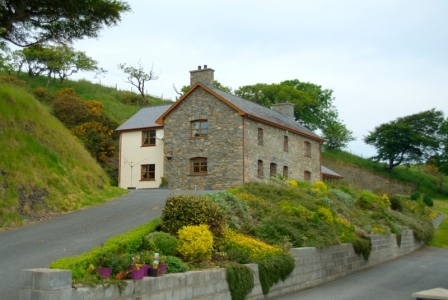 Completed in November by TTS Wales of Tregaron, it already blends quietly into the scenery. But there is a recent history equally worthy of recall, perhaps especially in the light of Hafod’s heritage of the sublime. Little could be more awesome than to fly over this unprotected chasm on a bicycle! The photographic evidence is out there on the internet and can be reproduced here. 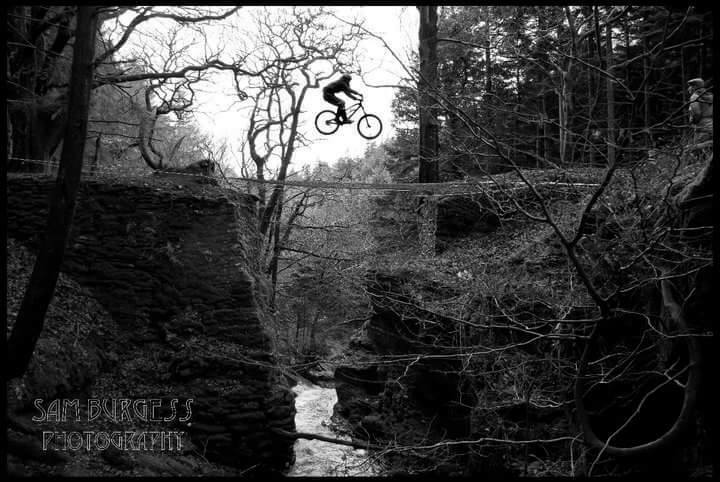 This dizzyingly dangerous feat recorded in colour was at least preceded by trial jumps with a safety net rigged across the gap. 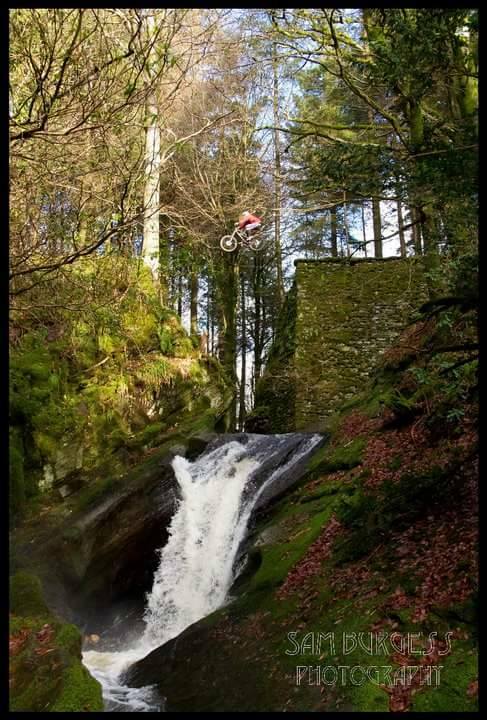 The rider was local boy Olly Davey, still living and still hurtling down mountains on bikes. You grow up at Hafod – you make your own entertainment! The adrenaline rush for the rider or spectator is surely the very essence of the sublime experience. Young men have always been fascinated by the possibilities of leaping chasms. I was brought up in Yorkshire where the best known legend concerned the Strid on the river Wharfe, where a 12th century youth, the Boy of Egremont, accustomed to leaping a pinch point on the gorge, failed to let his hound off the lead causing both to fall to their deaths. Many a chasm has a similar oral tradition. Health and Safety considerations have led the long jump to be confined to more prosaic environments these days. Indeed even the reconstruction of the bridge involved a quantity of scaffolding which would have astounded the former bridge builders. I am indebted to Jez Young, (who worked on the new bridge and recorded the details of progress on the building work in an excellent blog on Facebook), for drawing these historic images to light. 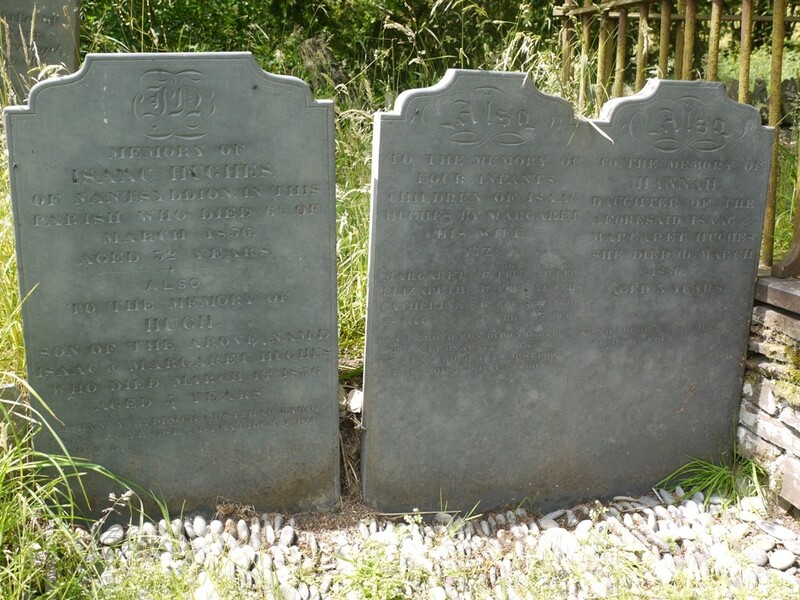 They are, rightly, part of the history of Hafod. We shall not see such a feat here again. 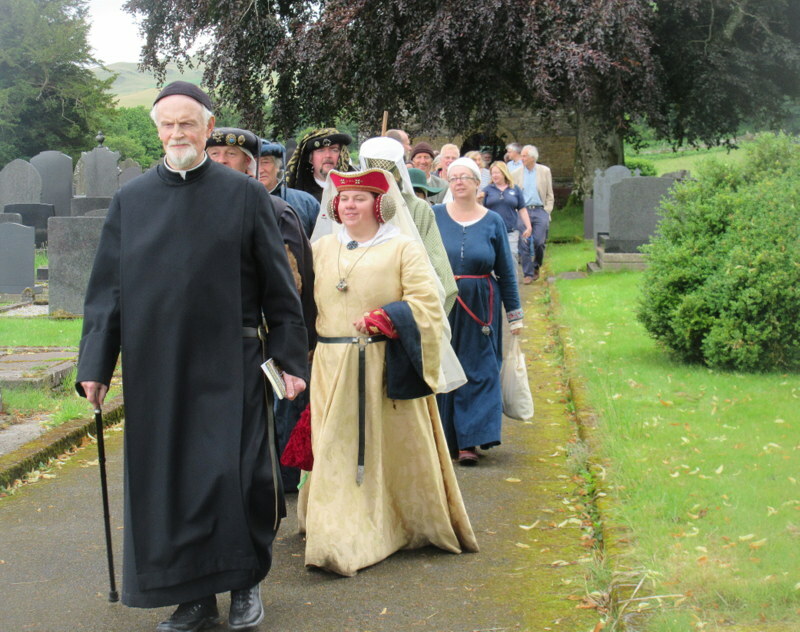 Some remarkable people turn up in Ceredigion from the wider world. 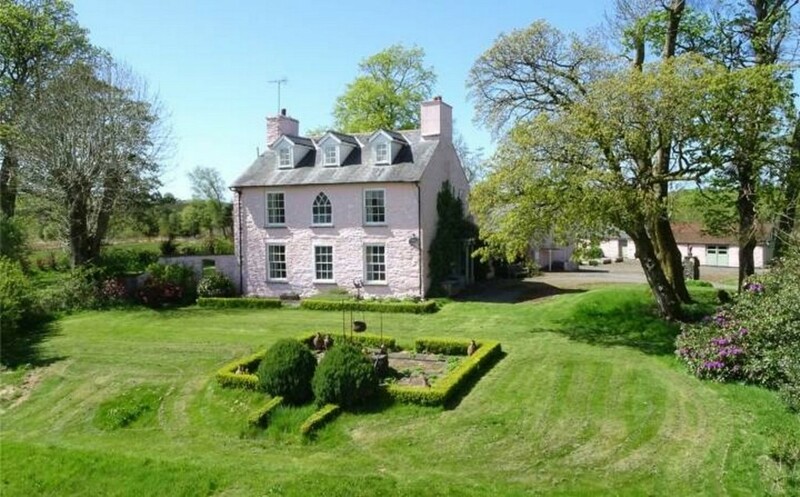 Two such were Nicholas Luard and his wife Elisabeth, who came to Brynmerheryn, an oddly handsome house set in some 100 acres high above Tregaron Bog. 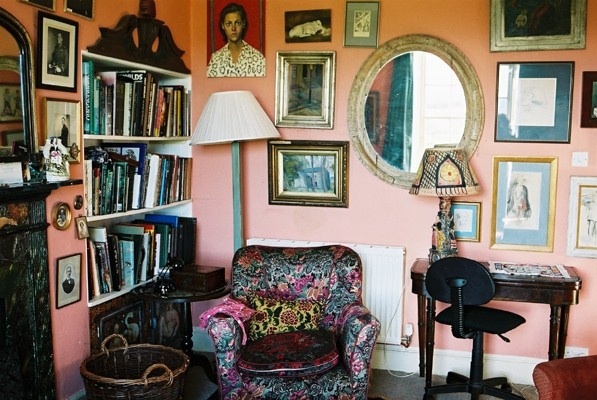 The house already had an eccentric history as the home of Monica Rawlins, friend and former student of the artist Augustus John, who bought it in the 1940s. Nicholas Luard was a notable figure in the irreverent 1960s, a new Cambridge graduate, founder of Private Eye, and co-owner with Peter Cook of The Establishment Club in Soho, which launched the careers of so many distinguished members of Beyond the Fringe. His subsequent career as writer, aspirant politician, philanderer, entrepreneur and alcoholic was more glamorous than remunerative, and throughout all its permutations was shored up by the indefatigable industry of his wife Elisabeth, cookery writer, novelist, botanical illustrator, and mother of his four children. Her 2008 book, My Life as a Wife, gives a spirited account of these vicissitudes, never tarnished by a trace of the fashionable self pity of so many modern memoires. It was Nicholas’ charm and charisma which eventually brought them to Wales in 1992, when he was left Brynmerheryn in Monica Rawlins’ will. Understandably eyebrows were raised locally at this bequest, for Monica was not, as is often said, his godmother, but the godmother of another Elizabeth, a girlfriend of his undergraduate days, who had taken him to visit her. With a talent for people, Nicholas kept in touch with Monica during the following 40 years, and no doubt she felt that the house deserved them. Monica herself was a distinctive character, whose diaries, much preoccupied with eugenics in her goose farming activities and with visits from her nephew, were recently adapted by Bethan Roberts for the Radio 4 drama Writing the Century: The View from the Windows. Monica’s voice though, seems to have had a more plaintive tone. Elisabeth Luard rises gutsily to every challenge. 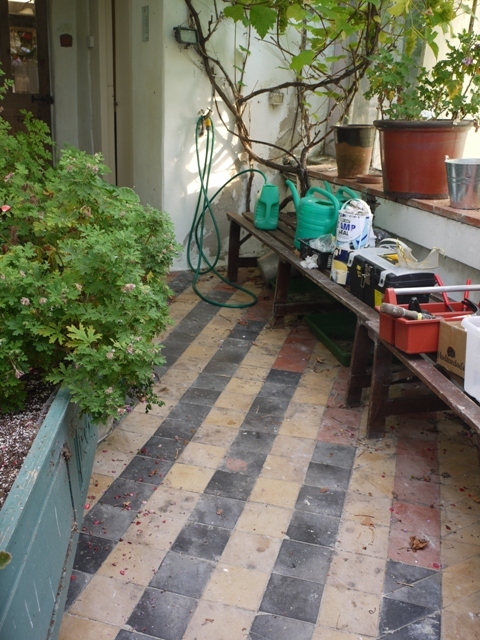 The latest is to leave Brynmerheryn and its accumulated memories. Nicholas died in 2004, and she is now leaving for a much smaller home in London, nearer to her children, and to the media opportunities her foodie expertise still commands. 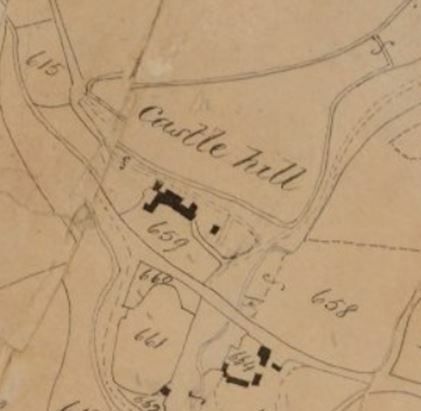 There may even be a few bits of Hafod mansion, (for in Monica’s day almost everyone of note in the area got a souvenir or two as the old mansion was stripped). 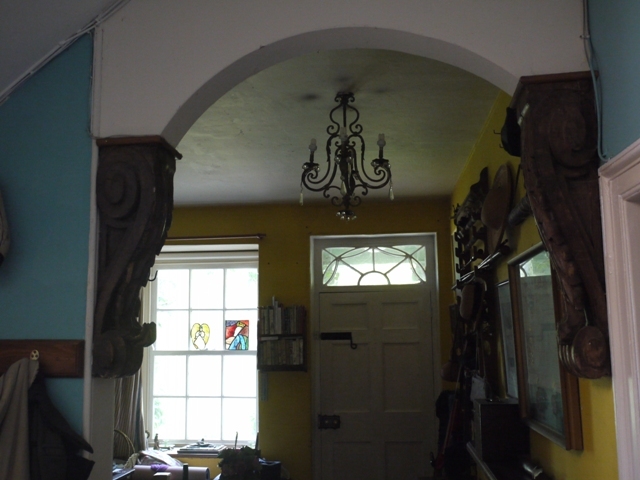 I do recollect a rather battered ornate gilded pelmet board above one window, and two massive carved oak consoles ( tall corbels) incongruous with the rest of the decor, but these of course are fixtures and fittings and will doubtless go to the new owners, who I hope will relish the layers of character of their new home. 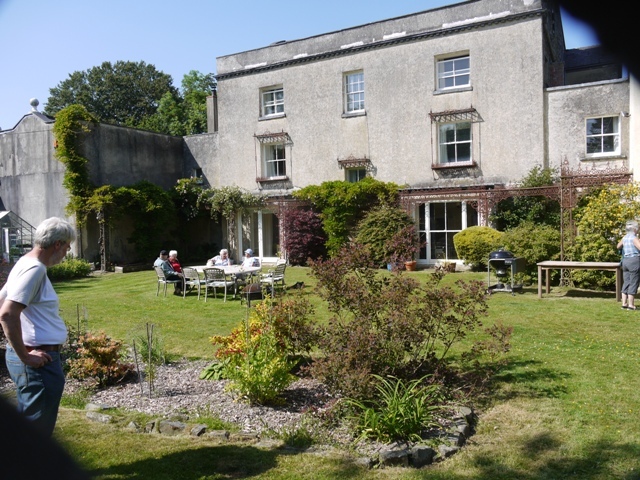 I shall be sorry not to be there, but am already committed to the Ceredigion Local History Forum, whose spring meeting on Mansions & their Estates in Ceredigion occurs on the same day. For directions and details on Facebook click here . Derelict buildings are invariably poignant, but particularly so when they retain the traces of domestic life, a palimpsest of their past occupants. When I first moved to Wales and explored my neighbourhood I happened upon an isolated farm, Pengraig Draw up a stony track near the coast. At some time, years before, the entire end of the farmhouse had collapsed outwards, and there it stood, like a dolls house open to the elements. 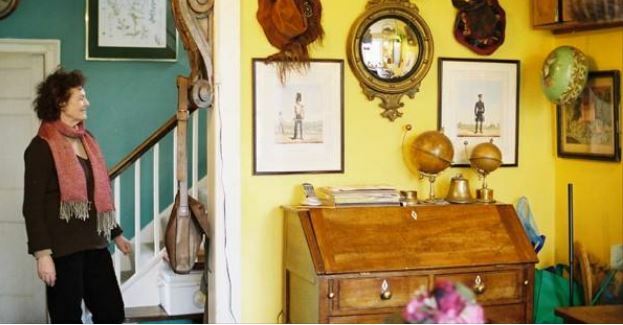 The upstairs bedroom was still furnished with bed, chest of drawers and a old chaise longue, but the collapsed stairs and dangerously sloping floor prevented access. The scene was reminiscent of wartime bomb damage in the immediacy with which the the disaster must have occurred. It remain in this condition for many years, the furniture weathered by the rain. Only quite recently was the old house rescued and renovated. The end wall is now rebuilt and it is a tidy holiday letting property with a conservatory extension, and even a hot tub in the garden. The romance of dereliction is but a memory. 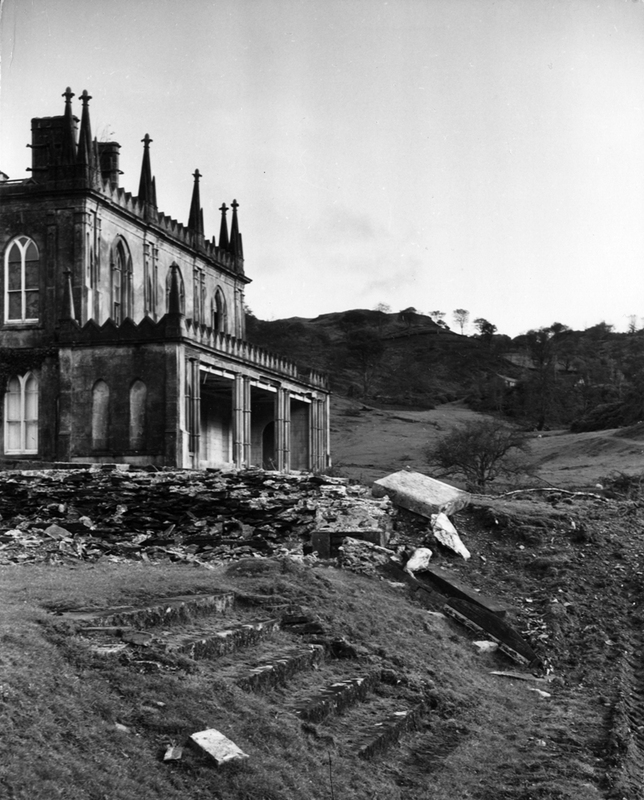 A far more celebrated ruin is that of Thomas Johnes’ Hafod, which was eventually dynamited by the Forestry Commission in 1957. In fairness to the apparent vandalism of destroying an architectural gem, it was, by this time in a sadly neglected state. The last owner to live there, master builder and timber merchant W.G. Tarrant had died suddenly on Aberystwyth railway station in 1942 and subsequent owners, also timber merchants did not live there, but stripped out everything of value for salvage sale. 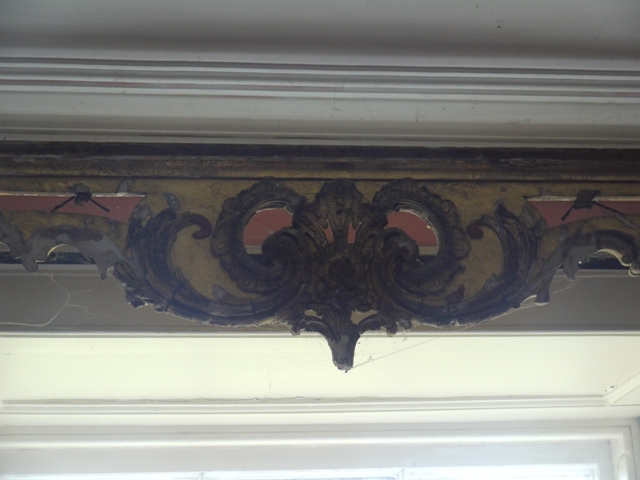 There are bits and pieces of Hafod in houses and cottages all around the neighbourhood, purchased or scavenged in the last days of the house. 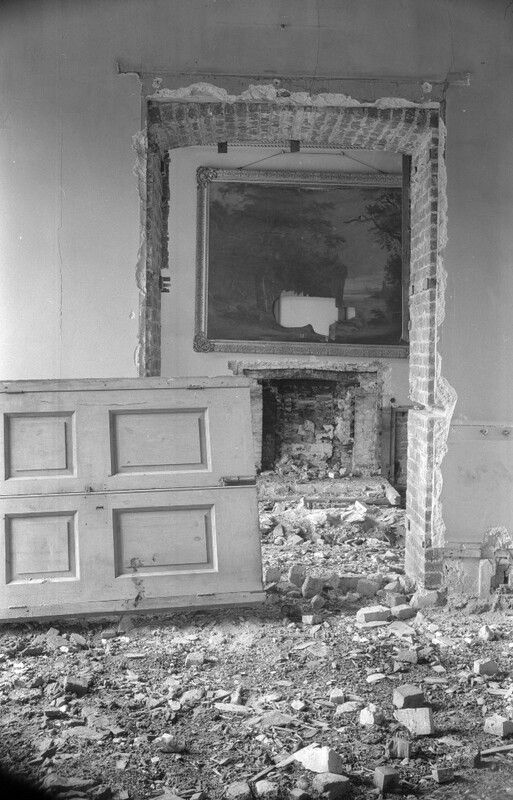 It is evocative then, to see photographs taken in 1957 by Edwin Smith, shortly before, or during, the destruction of the house, which are in the RIBA collections. The large and never-occupied Italianate wing built in the late 1840s by Anthony Salvin for the then owner Henry de Hoghton, is already a pile of rubble. Most poignant of all is a view of the interior showing the ravages of pre-demolition salvage. A handsome fireplace has been prised from the chimney breast, the Georgian door and door frame have been ripped out, some wooden shutters are propped across the doorway. Yet above the former fireplace still hangs a large oil painting of a landscape in a lavish gilt frame. The huge rip in the canvas explains its insignificance at this time. 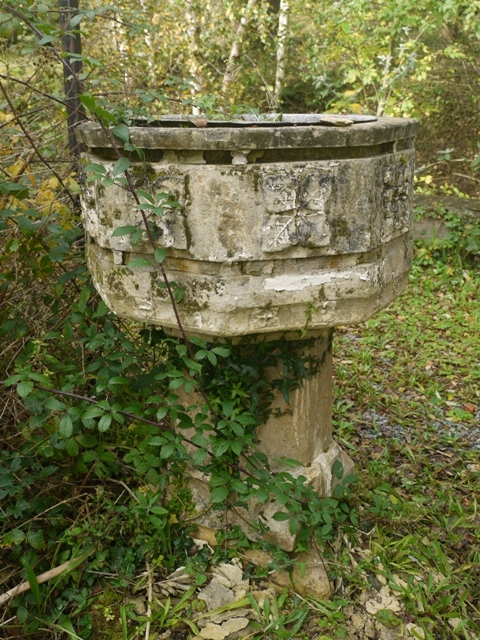 Though it would be romantic to think otherwise, the picture almost certainly was not a piece of Johnes’s property, more probably it was one of the fixtures belonging to the last serious owner, T.J. Waddingham who died age 98 in 1938. But one still shudders to see it, not decently tidied away before the final destruction was commenced, but hanging on the wall as a reproach for all the misfortune which befell the house. 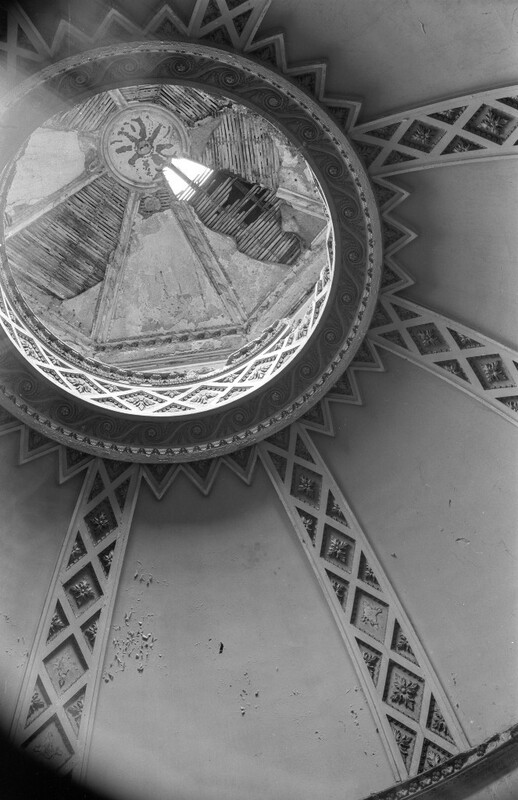 Also in the collection are pictures of the architectural splendours now lost, including a detail of the domed roof the ante room to the side of the Octagon library, now ruptured to the sky. 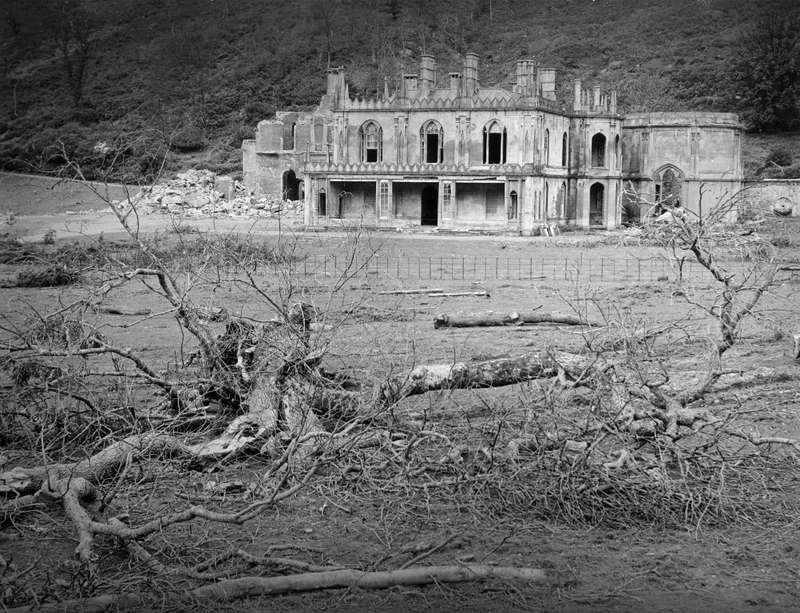 The decaying steps leading from the former lawn, the broken windows and rubble of plaster on the floor are perhaps the best evidence that by 1957 Hafod was indeed very far gone. Today the rubble is overgrown by trees. Only the cellar remains, with a crust of broken wine bottles scattered below the wine racks, and a slew of rubble blocking the cellar steps. 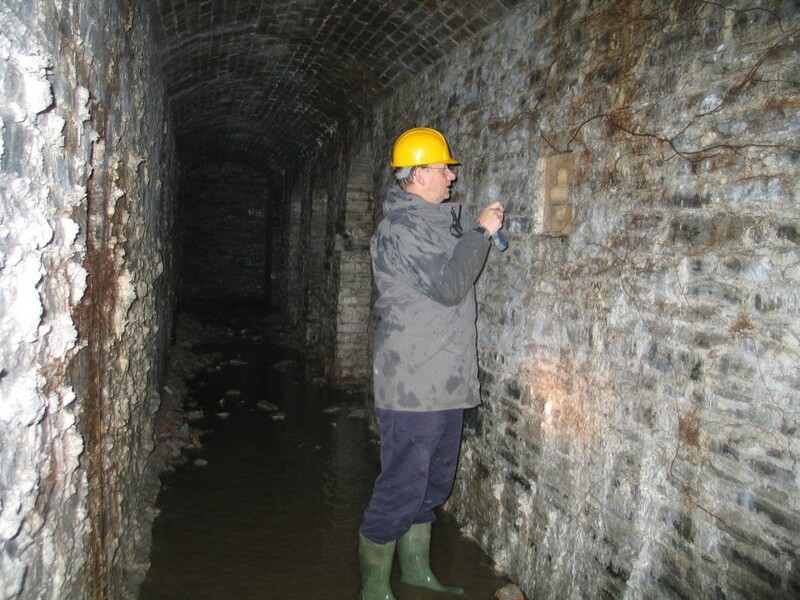 A few years ago it was briefly possible to walk along these damp subterranean corridors, but the only inhabitants are bats and the makeshift entrance is barred by a sturdy gate to prevent risk to unwary explorers. 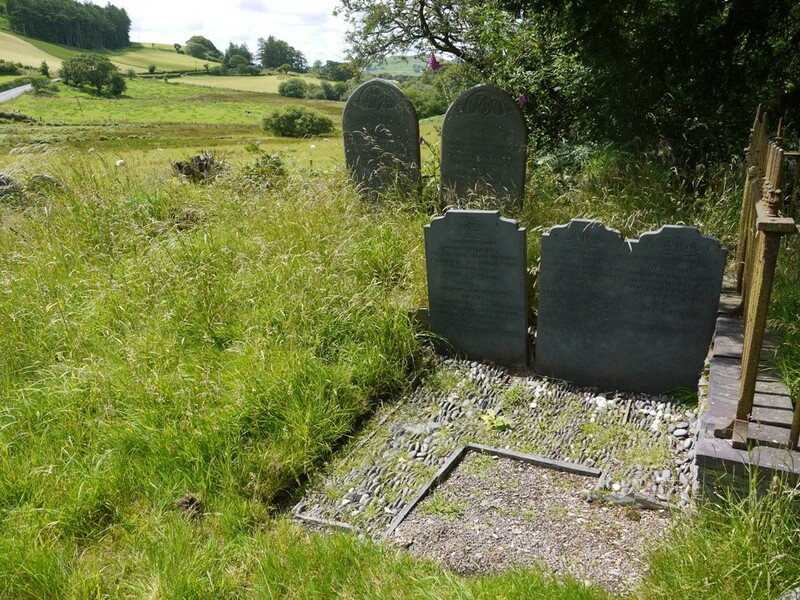 In the case of Pengraig Draw, the past has been totally obliterated by modernity. 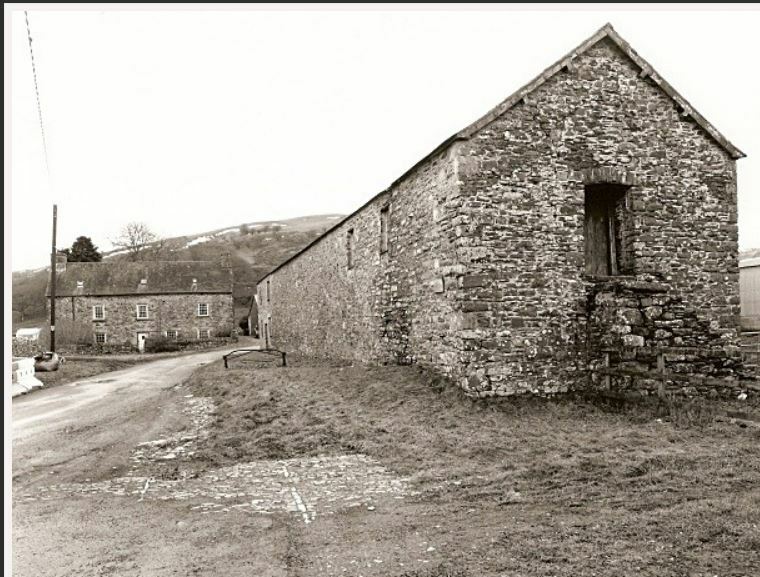 At Hafod it remains hauntingly present. I’ve been re reading Juliette Woods article ” Nibbling Pilgrims and the Nanteos Cup: A Cardiganshire Legend” which was published in Nanteos – A Welsh house and its Families, Ed. Gerald Morgan (2001). In it the author carefully enumerates the written and the oral record to compare it with the fully fledged early 20th century legend of the Nanteos Cup. At its most florid, this damaged fragment of a wooden drinking vessel is believed to be the Holy Grail, brought to England by Joseph of Arimathea, cherished by the monks at Glastonbury, some of whom, at the dissolution of their monastery, fled with it to Strata Florida Abbey in Cardiganshire, from whence it passed into the hands of the Stedman Family of that community, and thus, by marriage to the Powells of Nanteos. In modern tradition the cup has spectacular healing powers, and its last custodian at Nanteos, Margaret Powell discretely massaged its reputation with testimonials from the healed. The cup is also sometimes alleged to be fashioned out of a fragment of the true cross – though this would not fit with the Holy Grail story in which Joseph of Arimathea caught Christ’s blood in the cup at the crucifixion. 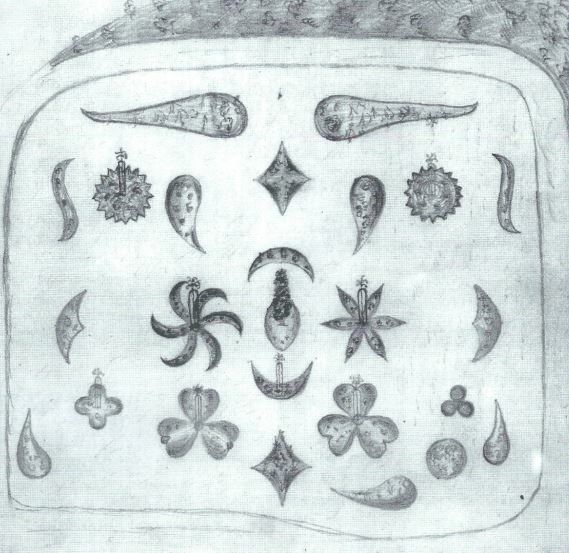 Juliette Woods gives a lot of attention to the common mechanisms by which such local legends are invented and augmented over time, but in essence her conclusions are that there is no written evidence of its importance and apparent healing powers until the mid 19th Century, and no indication of the Grail story until the early 20th. 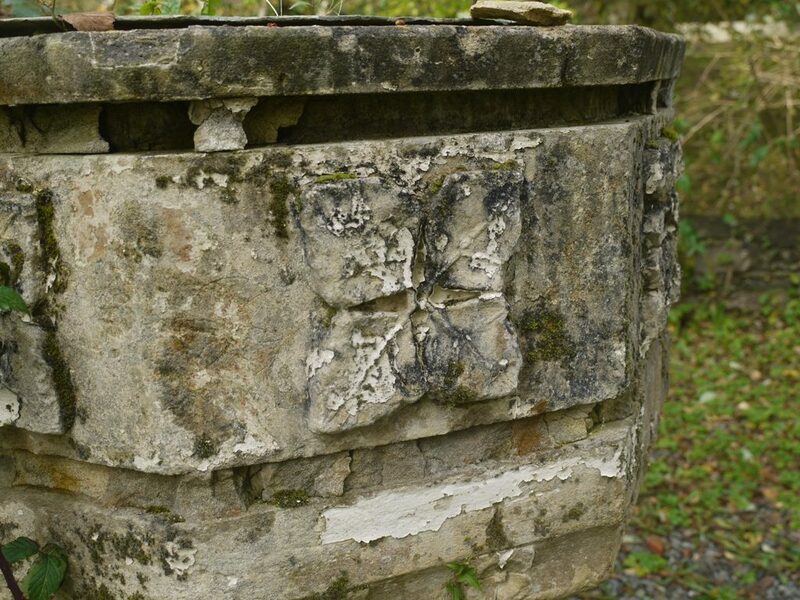 The cup first came under public scrutiny in 1878 when George Powell, a keen aesthete and antiquarian, allowed it to be exhibited to The Cambrian Archaeological Association at Lampeter. There was no allegation about the Holy Grail back then. It and another wooden vessel owned by Thomas Thomas of Lampeter were described as “supposed to possess curative powers”. 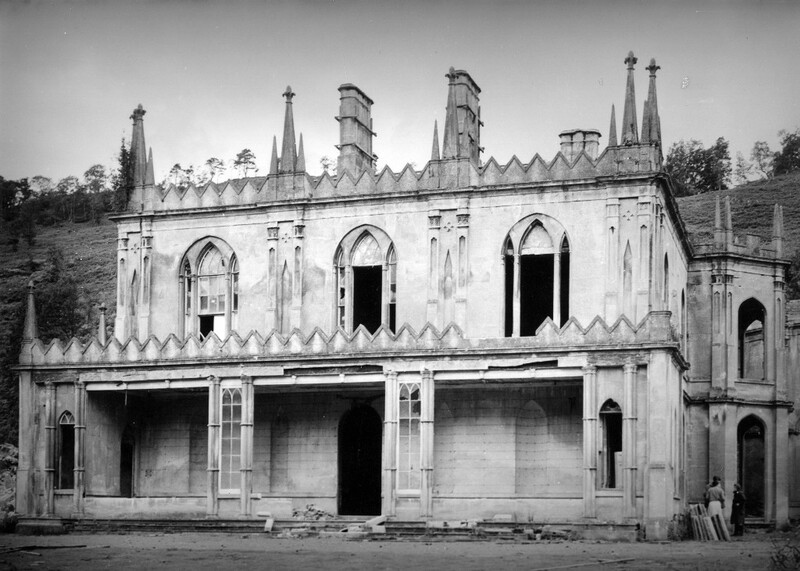 The newly-fledged “Cambrians” as this genteel antiquarian society were generally known, were on a mission to ferret out antiquities from gentry homes and churches. But the power of a good legend is in its ability to grow and mutate. Margaret Powell, who as a widow ruled Nanteos from 1930-1952 upheld the Grail myth, but with delicate discretion, refusing to allow the allegation to be associated with her name in print. Journalists, travel-guide authors and religiously-inclined scholars soon put in their pennyworth, and the Nanteos Cup gained followers. The Revd Lionel Smithett Lewis, Vicar of Glastonbury in 1938-1940 was one such enthusiast, fired up by A.E. Waite’s book Hidden Church of the Holy Grail (1909) which linked the grail to early Celtic Christianity. 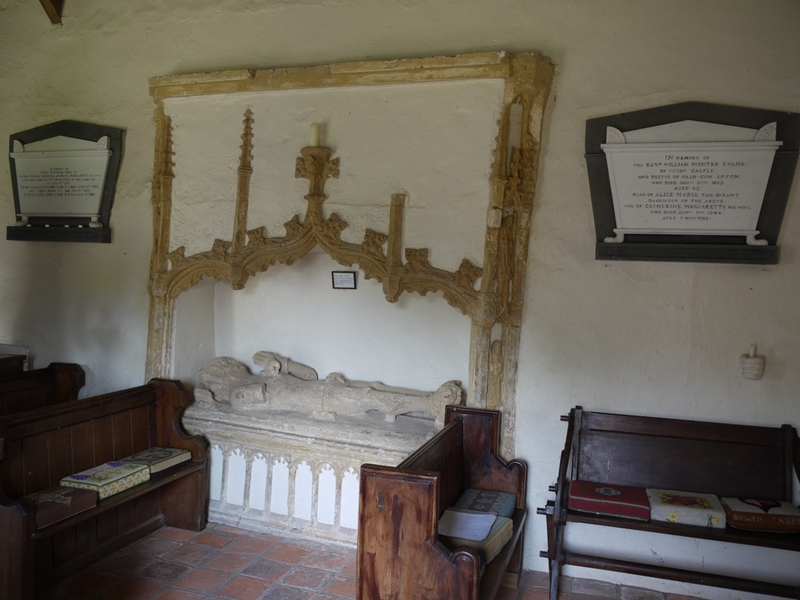 Smithett Lewis corresponded with Mrs Powell, and embellished the myth with the ‘discovery’ of a cupboard at Ozleworth Church, used by the Glastonbury monks to house the grail overnight when benighted too far from their abbey. Smithett Lewis wanted the Grail to be housed in a splendid reliquary at Glastonbury. Mrs Powell evidently did not co-operate and the correspondence ceased. 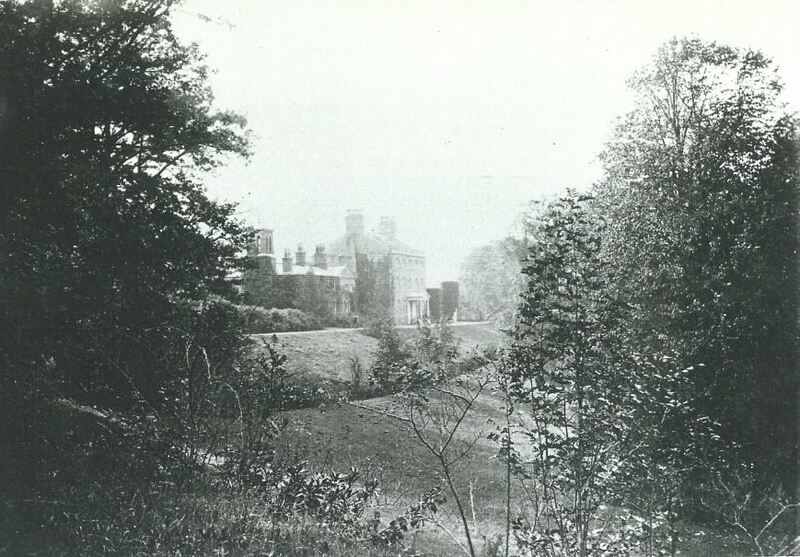 By the 1960’s the old mansion was in the hands of its first non-hereditary owner, Liverpool dealer Geoffrey Bliss, and the original cup had been transferred to a bank vault in the care of the Mrs Powell’s relative and inheritor, Mrs Mirylees. 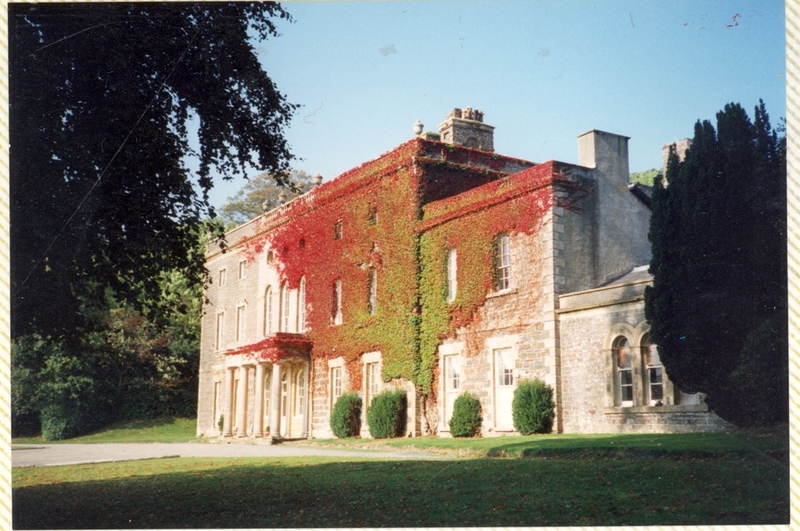 I visited Nanteos during the Bliss family occupancy, the house had been sold complete with most of its furnishings and portraits and despite the actual holes in the roof of one wing, it was open to the public as a stately home. And by then there was a facsimile holy grail to be seen in a lighted glass-fronted cabinet in the anteroom to the Library on the west end of the house. This may indeed have been the one said to have been made by a local craftsman to enable Mrs Powell to reduce wear upon the original unless its curative powers were actually required. The ‘real’ cup meanwhile has gone from strength to strength. Throughout the 1990s you could send to America for a prayer cloth or tissue impregnated with water which has been poured from it. Presumably, as with homeopathy, this church in Seattle would allege that the greater the dilution, the more powerful the effect it would have. More recently, impregnated cloths were available from The Rt Reverend Bishop Sean Manchester, author of several non-fiction books, including “The Highgate Vampire”; “The Vampire Hunter’s Handbook”; “Mad, Bad and Dangerous to Know”; “From Satan To Christ”; and “The Grail Church.” However the supply dried up in 2014 when the cup was apparently stolen from the home of an elderly woman in Weston-under-Penyard, in Herefordshire. Last year there was a further flurry of notoriety when the Grail had a spot on BBC’s Crimewatch. Muddying the history further, some news accounts showed an old photo of the missing object, ( though this was possibly a photo of Mrs Powell’s facsimile rather than the original) while others included illustrations from the Indiana Jones film starring Harrison Ford! In June 2015 it was revealed that the cup had been returned but that no charges were being pressed. 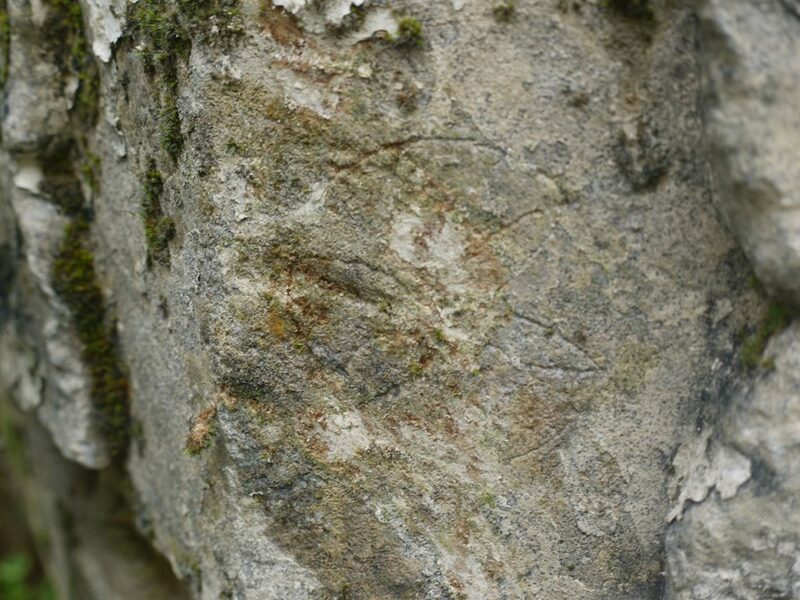 The police photo of the object they recovered closely resembles the 1888 sketch in Archaeologia Cambrensis and the early photos of the cup which are housed at the Royal Commission on the Ancient and Historic Monuments of Wales rather than the picture above. I have recently heard that its new home is to be in the National Library of Wales. Meanwhile new convolutions constantly develop. 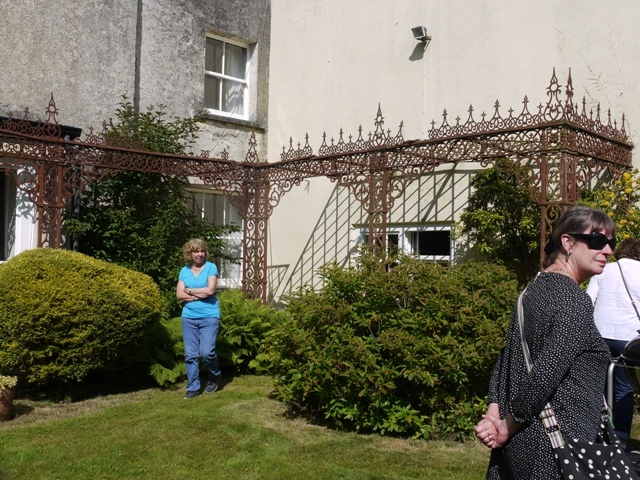 At Nanteos, which is now a smart country house hotel, there is a new garden feature in the old shrubbery adjoining the walled garden. A labyrinth by eco-mystic woodcraftman Bob Shaw leads on a contemplative circuit to a central sculpture which represents the Nanteos Cup, borne on a tapering plinth. 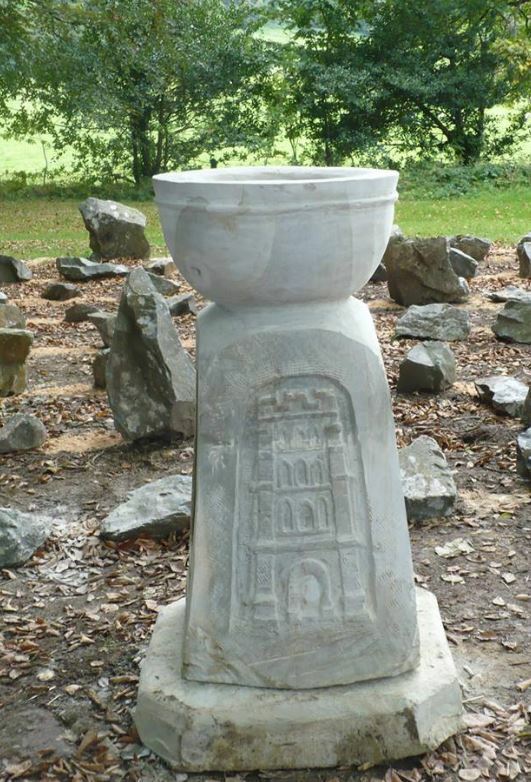 The four sides of the plinth sides depict the mansion, Strata Florida, Glastonbury Tor and the Nanteos cup. Just to keep the legend alive. And Bob, who is a skilled craftsman working with traditional tools has also fashioned yet another Nanteos Cup, out of an ancient piece of timber he extracted from the Mawddach estuary. That will fox the carbon daters, as they strive to determine which cup is which! The wood could well be older than the true cross itself. Bob tells me that the hotel management are only too happy to keep his handiwork in their safe, and show it to favoured guests. Then there is a further development, in the form of a historical novel, The Shadow of Nanteos, by Jane Blank published this year by Y Lolfa. Now I know this is fiction, but for many readers the distinction becomes blurred. Peacocks in Paradise, by Elisabeth Inglis Jones, which dramatises the life of Thomas Johnes of Hafod, is often perceived today as a purely biographical work. 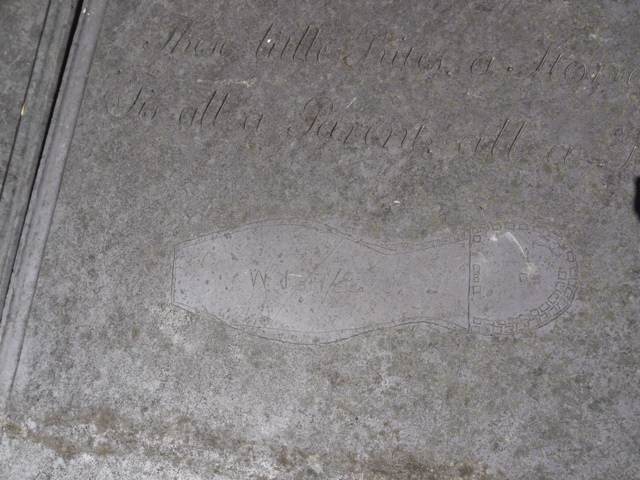 I found The Shadow of Nanteos unnerving myself because in it the very real Revd William Powell (1705-1780) who inherited on his brother Thomas’ death in 1752 is equipped with his historically correct wife, Elizabeth Owen. The book opens as he takes possession of Nanteos, his ancestral home. There however the resemblance ends: poor Elizabeth and William are supplied with quite different children, and a gothic storyline involving illegitimacy, adultery, leadmining, otter hunting, the death of their son, and finally the death of Elizabeth on the Nanteos kitchen table during a cesarean section to save the offspring of her steamy relationship with the bailiff. Ah me! What those Georgians got up to! But to return to the cup, – here all the components of the early 20th century fiction have been thoughtfully re-packaged to the mid 18th Century. Fictional Elizabeth invites round the local gentry wives and daughters, the Pryses of Gogerddan, the Lisburnes of Trawscoed and the Johnes of Hafod and they expound the whole story: Glastonbury, Joseph of Arimathea, Strata Florida, the Steadmans, the true cross, the Holy Grail and the nibbling pilgrims who bit pieces off the rim. ( The author must surely have read Juliet Wood’s painstaking work). Later in the book, driven to grief at the death of her eldest son, Elizabeth resorts to some very questionable frotteurism with the grail itself. Nanteos seems a particular magnet for the wild assertion! There are already a number of popular but questionable ghost stories associated with it and suggestible readers of Jane Blank’s work may soon find themselves sensing Elizabeth Powell eviscerated on the kitchen table. And there is a steady increase in the historic characters which are claimed among its house guests. Local historians have long been enraged by the early 20th century myth, first promulgated in a tourist guide to Aberystwyth, that Wagner stayed at Nanteos and wrote Parsifal there. There is no closer connection than that the aesthetically inclined George Powell ( 1842-1882) was an admirer of his, and planned a journey to Munich with his friend Algernon Swinburne, the poet, to witness the Ring Cycle. Algernon Swinburne and George also shared an interest in flagellation and the works of the Marquis de Sade. But that connection scarcely justifies the current naming of one of Nanteos’ rooms as ‘The Marquis de Sade room’, nor the recent assertion that Robert Browning stayed there too! The hotel website http://www.nanteos.com/news_detail.php?ID=51 reads as follows: Culture is all-pervasive at Nanteos Mansion with associations with leading European figures such as the composer Wagner and the poet Browning. It’s an easy concept to grasp, they are famous cultural figures and they both stayed at the Mansion while touring the country. But they didn’t. Though hotel guests will enjoy believing that they did.